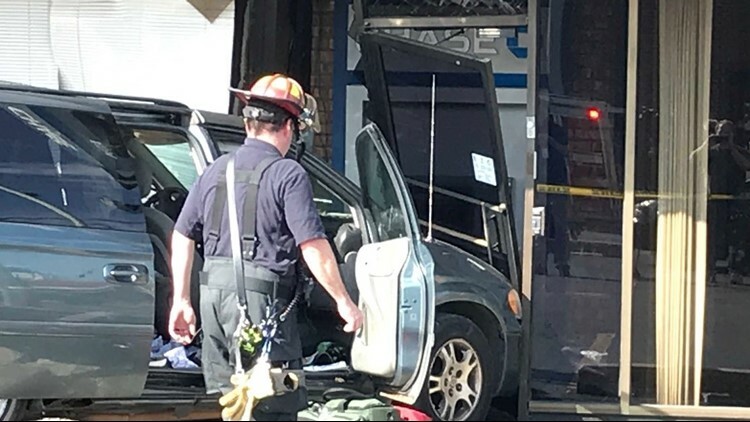 WYOMING, Mich. - Two cars crashed into a Chase Bank Wednesday, Oct. 3. The crash occurred in the 4300 block of South Division Avenue in Wyoming around 3:30 p.m. Authorities on the scene say the accident involved a truck and a van. The truck left the roadway, hitting the parked van in the bank parking lot, and then continued on into the bank building causing "severe damage," according to the Wyoming Department of Public Safety. "I was making a bank account and all of a sudden a truck just came through the window and it was spraying glass everywhere," recalls bank customer Kiera Vandentoorn. The pickup truck traveled all the way through the bank lobby and didn't stop until it struck a parked car on the other side of the building. "The truck went straight through," says Vandentoorn. "It narrowly missed a lady and the bank manager. I was maybe 6 feet. It was pretty scary." The van that was hit in the parking lot had three occupants, and all were taken to the hospital with non-life threatening injuries. Only minor injuries were reported by two people inside the bank. The driver and only occupant of the pick-up truck was also transported to a local hospital for treatment. "He was still sitting in the truck at the time I walked up to him," says nearby business owner Scott Mansel. "He was all disoriented. I don’t think he really knew what was going on. He was cut up, bleeding a little bit and I told him to sit right there and relax, the ambulance was coming." Police have not identified the driver or any charges he may face. Crews were already repairing the damage Wednesday afternoon. Bank management has not said when the branch will reopen, The fire chief says it could depend on whether there is structural damage.